As I’m typing this the sky just cleared up after freezing rain and snow. But this little lady doesn’t look like it matters to her! She’s choosing the bright side. Speaking of which, today I was going through the checkout at the grocery store and when the cashier asked how I was I said “I am well!”. She looked at me and said, “you’re the first person today who had a positive response to that question”. Prooves what a noticed influence a positive heart can be. I am grateful for life, no matter what the circumstances of the day are. I decided that I needed some "creative me” time this afternoon. 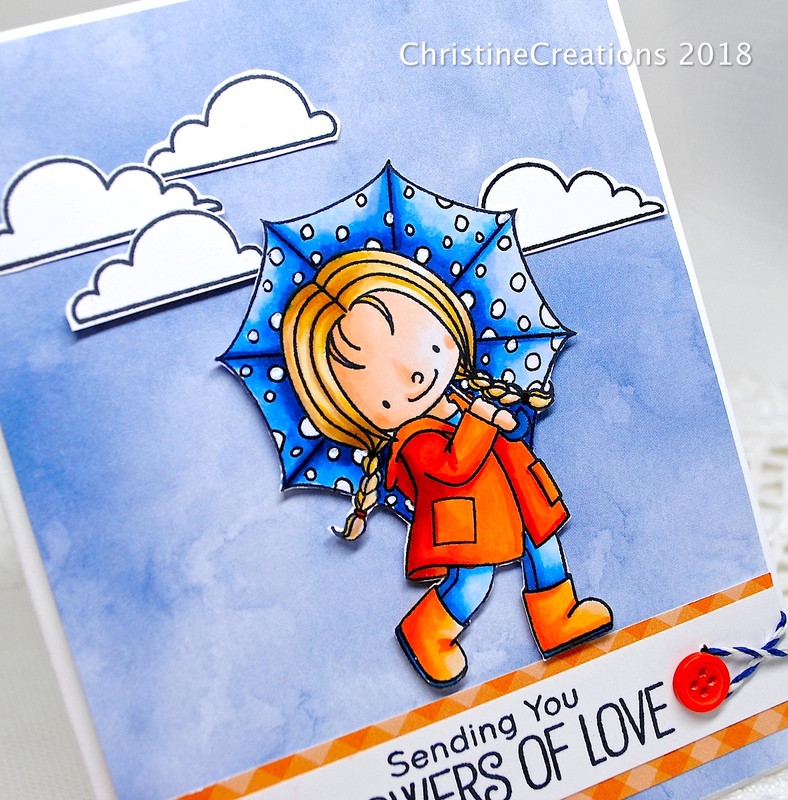 I have a host of coloured images on my desk that have just never made their way into cards, so I pulled this cutie out from MFT called Rain or Shine. She’s coloured up with vibrant oranges and deep blue Copics for fun. I added some polka-dots to the umbrella with a multi-liner and white gel pen to add some pattern. The background is from MFT’s Watercolor Wash Patterned paper stack. 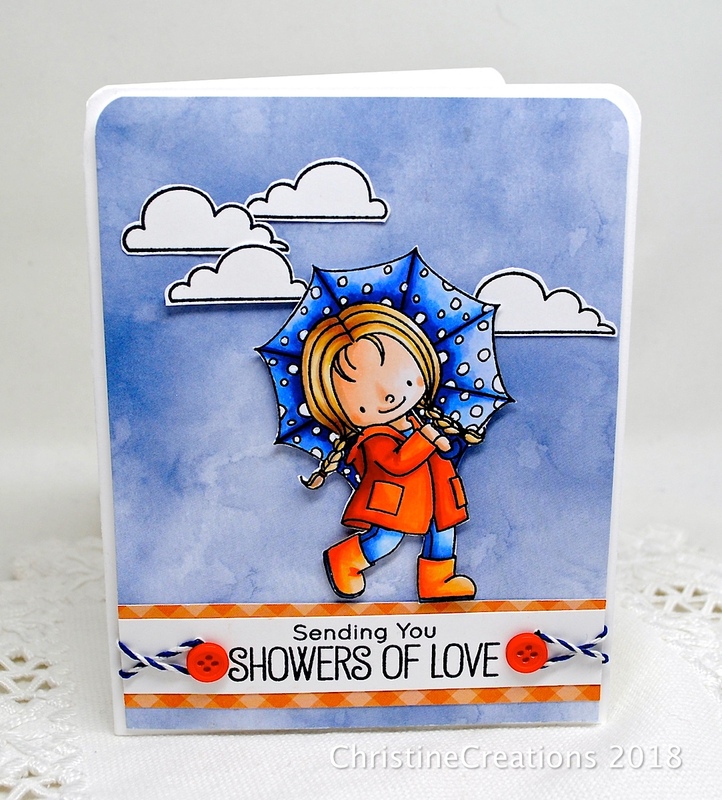 I’m also playing along with this week’s MFT Sketch Challenge. She’s accented with clouds from the set, and some baker’s twine and buttons, as well as some MFT patterned gingham paper. I like the idea of having a host of colored images just waiting to be made into cards. I should try that. Bet this little darling was fun to color. You sure made her into a cute card! I believe if you smile and think good thoughts and force out the negative as much as possible it will effect, not only your mood, but that of the people around you, as well. Good on you, Christine.